One of the best things about being a PC gamer is that you can create your own gaming experience depending on your rig. Gamers continue to up themselves by creating better and better setups that make titles more immersive. Of course, building your own gaming PC is tough work, not to mention very expensive. If this is what you prefer over buying pre-made setups, then you are bound to face a few tough choices along the way. A graphics card or a GPU is an important part of your PC set up. Everything you see on your monitor is made up of tiny dots we call pixels. There are millions of pixels in a screen and to display the images, the CPU needs to translate the appropriate data for the monitor to display what we are supposed to see. Some motherboards have built-in capabilities to do this on their own. If your motherboard doesn’t have it, then that process takes place in the graphics card. If you are building your first PC, your friends and several experts will tell you to spend your money on the best graphics card. The better your graphics card, the better the visuals of your games. You can force your PC to run ultra high-quality titles even if your graphics card is sub-par but good luck playing through the serious amount of lag you will face. That’s why it’s important to rely only on the best graphics card for your PC build. Even if you’re an expert in building PCs, it will be hard to find which graphics card is the best for you. 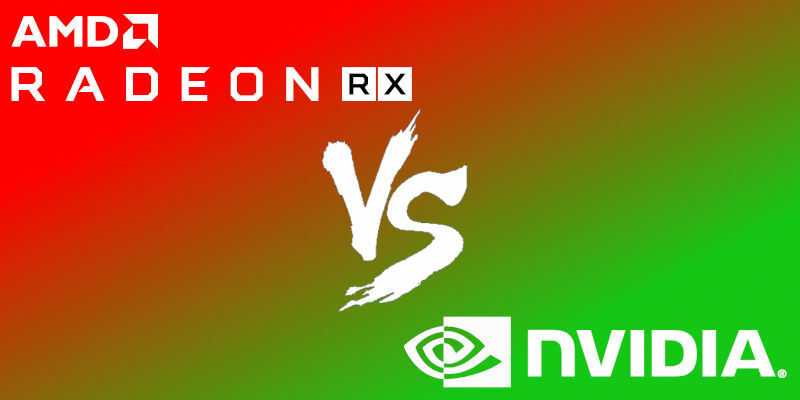 Ideally, people pick between two brands; Nvidia and AMD. There’s no definite answer as to which of these two graphics card manufacturers are the best as each has its own merits. Still, we’re here to help you make a well-informed decision for your graphics card. To make this long-running debate easier to settle, we’ll talk about the various things you should expect from a graphics card and then we’ll see which of the two top brands win in the category. A graphics card’s performance is the main basis of what makes it a cut above the rest. Basically, you should be looking for graphics cards that will push your PCs to its limit and will allow you to play games on the best settings possible. Currently, the best performer in the market is Nvidia’s RTX 2080 Ti. The latest in the RTX series of Nvidia blows away other consumer-grade graphics cards in the market. It comes packed with 11GB of GDDR6 memory plus high-end Tensor and RT cores. Both of which allow the RTX 2080 Ti to enable AI-controlled super sampling plus real-time ray tracing to boot. That being said, the RTX 2080 Ti is capable of running 60fps in 4K for a vast majority of games. In fact, it might only have issues running games at this quality if they are just released. In terms of performance, it’s Nvidia that’s always at the top of the food chain but that isn’t to say that AMD doesn’t have anything to show for its popularity among gamers. At CES 2019, AMD revealed the Radeon VII which is its next generation of graphics cards. It is very popular with testers already with some claiming that it is up-to-par with the performance of Nvidia’s RTX 2080. However, for it to be capable of running that similar performance, you will have to turn on extra features such as DirectX 12. On the upside, AMD didn’t hold back in giving Radeon VII a hefty 16GB of HBM2 memory. Of course, it would be a mistake to solely base your decision on the benchmark performance of NVIDIA and AMD’s graphics cards. You should look at the extras that come bundled in with these graphics cards as well. These extras may not make your games look better, but they upgrade the overall gaming experience in their own little ways still. From the get-go, we’ll give praise to Nvidia because of its GeForce Experience software. If you aren’t familiar with this, it is a program that can deliver driver updates immediately. Aside from that, the GeForce Experience also optimizes your games so that they can look better than ever. The software is essential in making sure your gaming experience is at its best. To cap it all off, you can stream gameplay and take screenshots via its intuitive interface. Time and time again, players have praised the GeForce Experience for being the definitive software to improve your gaming. That’s not to say AMD’s software isn’t formidable somehow. Its recently announced Radeon Software Adrenalin 2019 Edition is a rival to the GeForce Experience. What’s great about the Radeon Software Adrenalin is that it is consistently growing. AMD is never to shy on releasing updates that add an assortment of features for gamers to enjoy. Just recently, the company added a feature that allows you to directly stream games to your mobile device; a feature that GeForce doesn’t have currently. At the rate AMD is going, there could be a time when the GeForce Experience is dethroned as the king of optimization software. For this one, it’s hard to pick a clear winner. Nvidia’s current build for the GeForce Experience is currently the best when it comes to optimizing games. On the other hand, AMD’s Radeon Software Adrenalin is filled with great and innovative features that you need for a completely immersive experience. The way a graphics card is important, as well as this, can affect how fast your PC heats up and how much power it consumes along the way. While both developers offer quality graphics cards made from high-quality materials, there is a winner in this avenue but the gap between them is coming to a close. When building its graphics cards, Nvidia puts as much time and effort into it as it would with the software. In general, their products produce less heat and consume less power. Time and time again, it has become the benchmark of how graphics cards should perform inside your PC. It’s a different story with AMD. Its cards are known for consuming more power and for heating up fast. However, this issue is becoming less and less of that with each release. AMD has taken notice of the problem, and they are quick to find new solutions. AMD’s future lineup of graphics cards are expected to become better performers inside the PC and this might be a great reason why it’s time to invest in a Radeon. Verdict: Nvidia now, possibly AMD in the future. The truth of the matter is, graphics card are really expensive. Regardless of what brand you are getting, you are looking at losing at least several hundred dollars for a decent graphics card. When it comes to pricing, it’s not enough to pick which brand offers the least expensive cards. It also comes down to price for value. Currently, the Nvidia GeForce RTX 2080 TiNvidia GeForce RTX 2080 Ti is tagged at $1,199, which is almost double the price of its predecessor. While the graphics card is great overall, that price bump is just too much to handle for many. Some have criticized Nvidia for the price tag it placed on the RTX 2080 Ti and some have said that its upgrades over its predecessor is not enough to warrant such a price. There are affordable options from Nvidia but if you’re looking at high-end ones, expect to pay at least $800. On the other hand, AMD offers cheaper graphics cards. They’re still expensive but the difference between the two brands is staggering. By comparison, AMD’s Radeon VII is priced at $699. Remember, this is AMD’s latest graphics card yet it is half the price of the GeForce RTX 2080 Ti. That being said, it’s very clear that AMD has better value for quality cards. The truth is, there is no clear winner in this debate. It all boils down to what you need for your PC. If you are looking at the best performance possible and budget is not an issue, Nvidia’s latest graphics cards are the right ones for you. However, if you are going for its mid-tier performing graphics cards, we suggest moving to AMD as they have better priced mid-ranged cards. Obviously, AMD is the better choice if you are on a tight budget. Its top of the line graphics cards cost half of what Nvidia has in the top-tier. Moreover, AMD has a consistently improving line of graphics cards waiting so it might be a good choice to keep a close watch of the company while that growth is still happening. Your graphics card will make or break your gaming experience. Put a lot of thought into these cards before you make any major purchases. Remember, these cards don’t come cheap so it’s best to be sure that you’re getting what you really want.